I originally posted this poem last June. It was inspired by a post from Laurel’s Reflections (there is more about that below, with a link to her original post), who I am thinking about today. Laurel has since moved back to South Africa where she and her lovely family are thankfully thriving. This entry was posted in Art, Flowers, Love, Nature, Poetry, Repost, Writing and tagged Birdsong, Bluebells, Darkness, Heart, Laurel's Reflections, Promise, Rain, Sunshine, Woods. Bookmark the permalink. ← A House Near Luccoli is an Audiobook! What a wonderful tribute to Laurel! Lovely and yet I sense the fragile underpinnings of nature and relationships. Thank you! Lovely comment. Yes, our relationships are after all a part of the rhythm of nature. Your talent knows no ends! Such grace and beauty in all your work. My thanks, also, to Laurel for inspiring you to these heights. Beautiful work! Thank you so much, Sarah! You inspire me constantly. That is how it works with true creativity, isn’t it? Hi, Barbara! Yes, there is nothing like coming upon a bluebell wood … it’s almost indistinct, like a mist of sweetly scented blue. My first ‘experience’ of one was in the movie “Ryan’s Daughter’ – there is a love scene (albeit an illicit one) in a bluebell wood. Not only seeing one ‘in person’ but helping to encourage it was a very special time for me. Hi, Peter. I am so glad Laurel is back, too! She was one of my first followers and drew me into her heartfelt reflections immediately. And – Beatrice Potter – what a compliment. I hope I can continue to create to such a level of blending imagination and reality! Blessings. Hi, Marie. Thank you and I am glad you enjoyed that verse, especially. And what a lovely tribute for Laurel at this difficult time. Im sure she will love this post, and the fact that she inspired you! 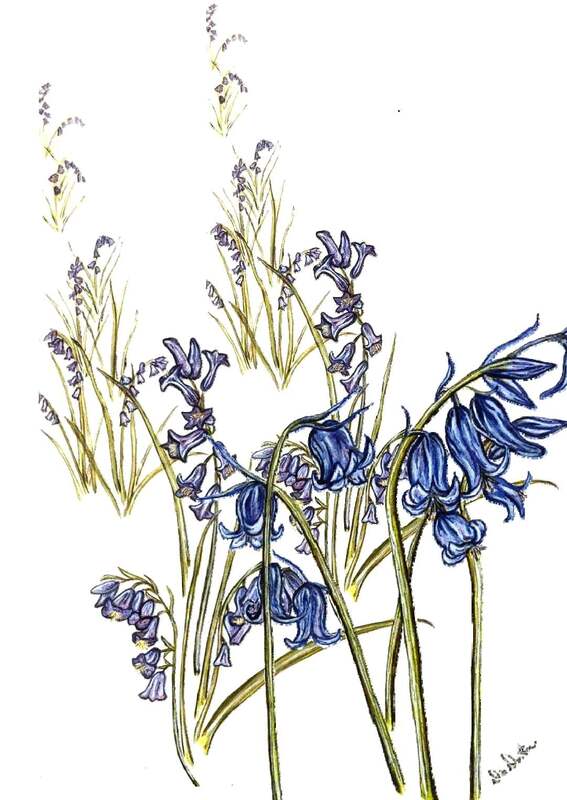 The painting is gorgeous; bluebells are indeed very modest flowers. Love the quote and the You Tube video is gorgeous. Hi, Christine – as you didn’t see this one, I am SO glad I reposted! I love it that you catch my ‘novel voice’ here. I have always loved bluebells … they have this fragil resilence about them, much like a willow tree. They always make me think of the lovers bluebell wood scene from Ryan’s Daughter … I tried to find a clip but couldn’t. I remember this poem, Diane. It makes me feel happy just the way it did the first time I read it. Just wonderful. right now at our farm it is the yellow dandelion buttons!